I don’t feel shy about asking for this, because I know that we’re already your pick! Delivering satisfaction to our customers is what we’re all about at Russell & Abbott. We hope that we’ll always be your choice for a heating and air conditioning company in Maryville, TN and the surrounding areas. Please read this carefully, since failing to follow the instructions will cause your vote to be disqualified. Pick companies for “Best” in the categories of your choice, and provide your name, address, and phone number. Vote for Russell & Abbott Heating and Cooling as the Best Heating and Air Company. 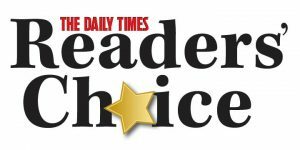 Ask your friends, family, and social media acquaintances to also vote Russell & Abbott Heating and Cooling as the Best Heating and Air Company. The easiest way to do this is to share the link! Voting ends on May 4, and the winners will be announced on June 26. I hope to be back then with good news! Spring is the time to schedule your annual air conditioning maintenance inspection and tune-up. If you aren’t yet a member of our Comfort Club, call us and we’ll get you set up. You’ll keep the warranty valid, enjoy steady and reliable cooling, experience few repair issues, and extend the life of your valuable HVAC equipment.